Recently I was asked this during a job interview. I was honest and said I knew how a symbolic link behaves and how to create one, but do not understand the use of a hard link and how it differs from a symbolic one. A file in the file system is basically a link to an inode. A hard link then just creates another file with a link to the same underlying inode. When you delete a file it removes one link to the underlying inode. The inode is only deleted (or deletable/over-writable) when all links to the inode have been deleted. A symbolic link is a link to another name in the file system. Once a hard link has been made the link is to the inode. deleting renaming or moving the original file will not affect the hard link as it links to the underlying inode. Any changes to the data on the inode is reflected in all files that refer to that inode. Note: Hard links are only valid within the same File System. Symbolic links can span file systems as they are simply the name of another file. Some nice intuition that might help, using any Linux(ish) console. foo-hard points to the inode, the contents, of the file - that wasn't changed. The contents of the file could not be found because the soft link points to the name, that was changed, and not to the contents. Likewise, If foo is deleted, foo-hard still holds the contents; if bar is deleted, bar-soft is just a link to a non-existing file. Look what will now happen if myfile.txt is deleted (or moved): my-hard-link still points to the same contents, and is thus unaffected, whereas my-soft-link now points to nothing. Other answers discuss the pros/cons of each. Hard links are useful when the original file is getting moved around. For example, moving a file from /bin to /usr/bin or to /usr/local/bin. Any symlink to the file in /bin would be broken by this, but a hardlink, being a link directly to the inode for the file, wouldn't care. Hard links may take less disk space as they only take up a directory entry, whereas a symlink needs its own inode to store the name it points to. Hard links also take less time to resolve - symlinks can point to other symlinks that are in symlinked directories. And some of these could be on NFS or other high-latency file systems, and so could result in network traffic to resolve. Hard links, being always on the same file system, are always resolved in a single look-up, and never involve network latency (if it's a hardlink on an NFS filesystem, the NFS server would do the resolution, and it would be invisible to the client system). Sometimes this is important. Not for me, but I can imagine high-performance systems where this might be important. I also think things like mmap(2) and even open(2) use the same functionality as hardlinks to keep a file's inode active so that even if the file gets unlink(2)ed, the inode remains to allow the process continued access, and only once the process closes it does the file really go away. This allows for much safer temporary files (if you can get the open and unlink to happen atomically, which there may be a POSIX API for that I'm not remembering, then you really have a safe temporary file) where you can read/write your data without anyone being able to access it. Well, that was true before /proc gave everyone the ability to look at your file descriptors, but that's another story. Speaking of which, recovering a file that is open in process A, but unlinked on the file system revolves around using hardlinks to recreate the inode links so the file doesn't go away when the process which has it open closes it or goes away. A simple way to see the difference between a hard link and a symbolic link is through a simple example. A hard link to a file will point to the place where the file is stored, or the inode of that file. A symbolic link will point to the actual file itself. Because file "c" points to file "a" itself, if file "a" is deleted then file "c" will have nothing to point to, in fact it is also deleted. However, file "b" points to the place of storage, or the inode, of file "a". So if file "a" is deleted then it will no longer point to the inode, but because file "b" does, the inode will continue to store whatever contents belonged to "a" until no more hard links point to it anymore. soft or symbolic is more of a short cut to the original file....if you delete the original the shortcut fails and if you only delete the short cut nothing happens to the original. Proof: readlink link Also in ls -l link output you will see the first letter in lrwxrwxrwx as l which is indication that the file is a soft link. Hard link is more of a mirror copy or multiple paths to the same file. Do something to file1 and it appears in file 2. Deleting one still keeps the other ok. The inode(or file) is only deleted when all the (hard)links or all the paths to the (same file)inode has been deleted. Once a hard link has been made the link has the inode of the original file. Deleting renaming or moving the original file will not affect the hard link as it links to the underlying inode. Any changes to the data on the inode is reflected in all files that refer to that inode. Output: A file with name link will be created with the same inode number as of Targetfile. Note: Symbolic links can span file systems as they are simply the name of another file. Whereas hard links are only valid within the same File System. Hard link point to the file content. while Soft link points to the file name. while size of hard link is the size of the content while soft link is having the file name size. Hard links share the same inode. Soft links do not. Hard links can't cross file systems. Soft links do. you know immediately where a symbolic link points to while with hard links, you need to explore the whole file system to find files sharing the same inode. hard-links cannot point to directories. The directories cannot be hard linked. Linux does not permit this to maintain the acyclic tree structure of directories. A hard link cannot be created across filesystems. Both the files must be on the same filesystems, because different filesystems have different independent inode tables (two files on different filesystems, but with same inode number will be different). Symbolic links link to a path name. This can be anywhere in a system's file tree, and doesn't even have to exist when the link is created. The target path can be relative or absolute. Hard links are additional pointers to an inode, meaning they can exist only on the same volume as the target. Additional hard links to a file are indistinguishable from the "original" name used to reference a file. Symlinks, unlike hard links, can cross filesystems (most of the time). Symlinks can point to directories. Hard links point to a file and enable you to refer to the same file with more than one name. As long as there is at least one link, the data is still available. update backup 0 with any changed files. The new backup will not take up any extra space apart from any changes you've made, since all the incremental backups will point to the same set of inodes for files which haven't changed. I add on Nick's question: when are hard links useful or necessary? The only application that comes to my mind, in which symbolic links wouldn't do the job, is providing a copy of a system file in a chrooted environment. 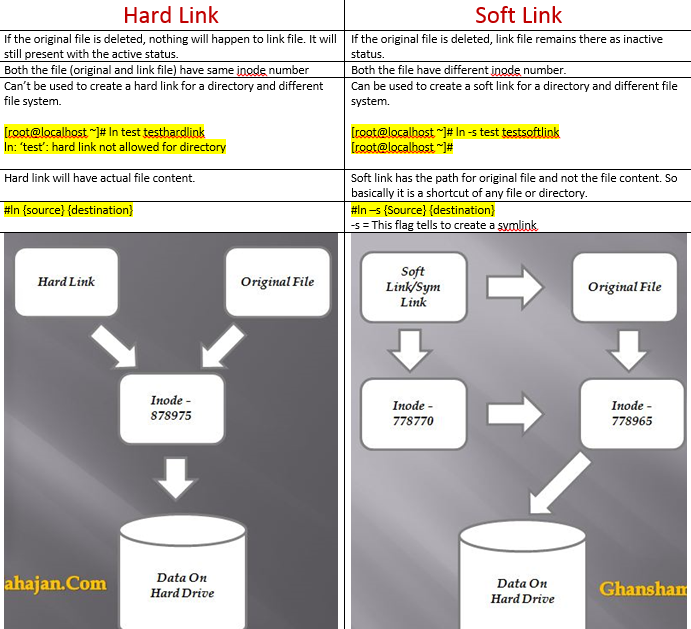 Hard link Vs Soft link can be easily explained by this image. What you think of as an ordinary "file" is actually two separate things: The data of a file, and a directory entry. When you create a hard link for a file, you actually create a second directory entry which refers to the same data. Both directory entries have the exact same functionality; each one can be used to open the file to read it. So you don't really have "a file plus a hard link", you have "file data with two directory entries". What you think of as deleting a file actually deletes a directory entry, and when the last directory entry for the data is deleted, then the data itself is deleted as well. For ordinary files that have only one directory entry, deleting the directory entry will delete the data as always. (While a file is opened, the OS creates a temporary link to the file, so even when you delete all directory entries, the data stays but disappears as soon as you close the file). As an example, create a file A.txt, a hard link B.txt, and delete A.txt. When you created A.txt, some data was created, and a directory entry A.txt. When you created the hard link, another directory entry B.txt was created, pointing to the exact same data. When you delete A.txt, you still have all the data and a single directory entry B.txt, exactly as if you had create a file B.txt in the first place. A soft link is just an (almost) ordinary file, except that it doesn't contain data, but the path of another directory entry. If you delete the file that the soft link refers to, then the soft link will contain a path that doesn't point to a directory entry anymore; it is broken. If you delete the soft link, it's like deleting any other file, the file it points to is unaffected. Simply , Hard link : is just add new name to a file, that's mean , a file can have many name in the same time, all name are equal to each other, no one preferred, Hard link is not mean to copy the all contents of file and make new file is not that, it just create an alternative name to be known.. Symbolic link (symlink) : is a file pointer to another file, if the symbolic link points to an existing file which is later deleted, the symbolic link continues to point to the same file name even though the name no longer names any file. A hard link is the file system representation of a file by which more than one path references a single file in the same volume. A junction (also called a soft link) differs from a hard link in that the storage objects it references are separate directories, and a junction can link directories located on different local volumes on the same computer. Otherwise, junctions operate identically to hard links. The bolded parts in hard link section and junction section show the basic difference between the two. I have a file f6 in my current directory, as well as a directory named t2. File named f1 and ./t2/f2 are symbolic links to f6. File named f7 and ./t2/f8 are hard links of f6. Since hardlinks can be created on the same file system, we can search all the hardlinks without -L option used (with -xdev option) in the same file-system/mount-point. It saves the unnecessary search into different mount points. So searching the hardlink is somewhat faster then searching the softlinks(Please rectify if I am wrong or not clear). Symbolic links give another name to a file, in a way similar to hard links. But a file can be deleted even if there are remaining symbolic links. I just found an easy way to understand hard links in a common scenario, software install. One day I downloaded a software to folder Downloads for install. After I did sudo make install, some executables were cped to local bin folder. Here, cp creates hard link. I was happy with the software but soon realized that Downloads isn't a good place in the long run. So I mved the software folder to source directory. Well, I can still run the software as before without worrying about any target link things, like in Windows. This means hard link finds inode directly and other files around. All the data that is saved is stored in memory using a data structure called inodes Every inode has a inodenumber.The inode number is used to access the inode.All the hard links to a file may have different names but share the same inode number.Since all the hard links have the same inodenumber(which inturn access the same inode),all of them point to the same physical memory. A symbolic link is a special kind of file.Since it is also a file it will have a file name and an inode number.As said above the inode number acceses an inode which points to data.Now what makes a symbolic link special is that the inodenumbers in symbolic links access those inodes which point to "a path" to another file.More specifically the inode number in symbolic link acceses those inodes who point to another hard link. Changes made to /short/file.txt will be applied on the original file. Not the answer you're looking for? Browse other questions tagged unix symlink hardlink or ask your own question. How do I add files from another directory with git? Can I add a file by putting the symbolic link in the git repository? Can hard links get broken? What is there behind a symbolic link? Does creating a hard link create a new inode? What's the difference between Symbolic Link <=> Junction <=> Shortcut? How to create hard/soft links in C?